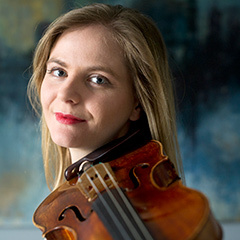 Since her coronation at the Long-Thibaud 2010 competition, the violinist Solenne Païdassi maintains her course with the determination, the integrity and the sensibility that define her playing. According to a large part of her faithful audience, the French soloist literally “sings” with her instrument. 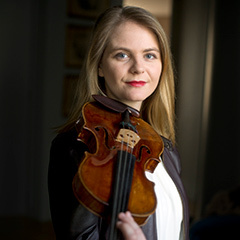 Just as comfortable when playing Tchaïkovski, Brahms, Bach or Rihm, the young musician who perfected her skill in Nice, Geneva, Philadelphia, London and Hanover, joined the narrow circle of internationally renowned violinists. Her beautiful sound, her peaceful strength and her will to play for others are all keys to her success. She was invited as a soloist by the Orchestre Symphonique de Radio France, the Orchestre National de France, the Orchestre Symphonique de Montpellier, the Cannes and Auvergne Orchestras, the Orchestre National de Lille, the Orchestre Royal de Chambre de Wallonie, the Sinfonia Varsovia and much more… She had the opportunity to perform under the baton of Lawrence Foster, Shlomo Mintz, Vladimir Spivakov, Theodor Guschlbauer and Darell Ang. Critics highly praised her recordings. The first one, recorded with French pianist Laurent Wagschal, is dedicated to Franck, Pierné, Saint-Saëns and Massenet (Indesens, 2013). 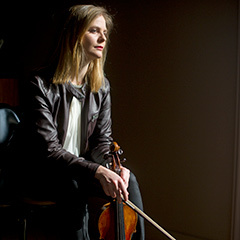 In 2014, she recorded an opus dedicated to Stravinsky and Szymanowski (Aparté 2014) that was awarded a CHOC by Classica magazine. 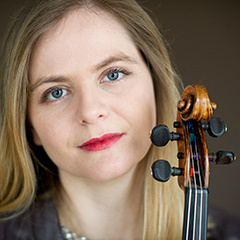 After finishing her studies at the Nice and Geneva conservatoire, then at the London Royal Academy and at the Philadelphia Curtis Institute of Music, Païdassi received her diploma at the Hanover Hochschule für Musik und Theater. Winner of many awards, in France (ADAMI 2012) and abroad, she stood out during the Hanover international competition of in 2009, the Sion-Valais competition and the Gyeongnam competition in Korea. Païdassi is a regular guest on France Music but also on Deutschlandradio Kultur and NDR Kultur. She was broadcasted in the SüdWestRundfunk with the Stuttgart Radio-Sinfonieorchester in 2012. She plays on a Giovanni Battista Guadagnini of 1784, lent by the French Zilber Vatelot Rampal foundation.